What Are The Best Online Master's in Biomedical Engineering Programs? What Else Can I Expect From an Online Master's in Biomedical Engineering Program? As one of the fastest-growing engineering fields, careers in biomedical engineering are expected to increase 23% by 2024, which is well above average. Additionally, biomedical engineers earn an average of $85,620 per year, which is almost $50,000 more than the median annual wage for all occupations. 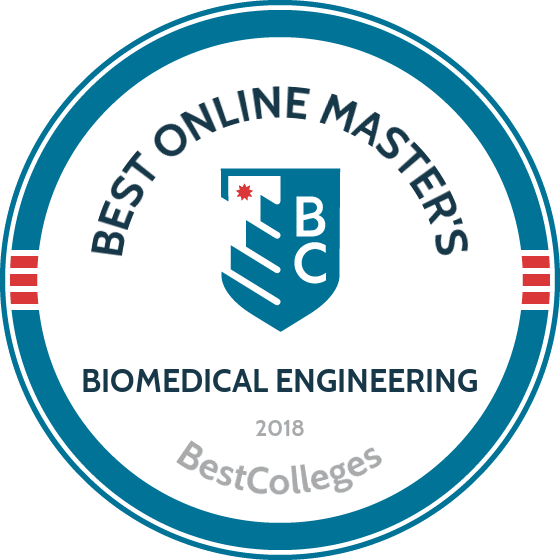 If you are interested in improving people's health by fighting disease, helping the aging population, or improving medical technology, you may want to consider our list of online master's degrees in biomedical engineering. Read on to learn more about the online master's programs that will prepare you for this rapidly expanding field. Biomedical engineering online master's programs vary among universities, with some offering the degree as a master of science and others offering it as a master of engineering; many also have thesis or non-thesis tracks available. Curriculum requirements are specific to each university, with some programs allowing students to tailor the degree to their interest, while others are fairly prescriptive. Though courses vary, many online biomedical engineering master's degrees include classes like those listed below. Quantitative Systems Physiology: This course introduces a quantitative, model-oriented approach to physiological systems -- a function of human body systems. Students should have completed prerequisite courses in basic physiology, math, and chemistry. In some programs, this course is taken as a two-semester sequence. This is a foundational course for anyone entering the biomedical engineering field. Biomedical Engineering Seminar: A component of nearly every biomedical engineering program, this course may be a non-credit requirement or a one-credit course. Usually focused on guest lectures, faculty presentations, and career-related topics, some programs allow the seminar to be repeated several times as the lectures vary each term. This class offers a good introduction to the available topics and careers in the field. Advanced Mathematics: While some programs stipulate completion of a statistics course or a discipline-specific course such as mathematical methods for biomedical engineering, others allow students to choose from a variety of advanced mathematics courses including calculus, computer science, or math classes specifically related to engineering or physics. Master's Thesis/Project: Some programs provide students with a choice between a thesis or non-thesis track. The non-thesis track often requires a final project or practicum, while the thesis or practicum topic is approved by a committee. The project focuses on research strategies and concludes with a presentation; the thesis involves a specific project, dissertation, and thesis defense. HOW LONG DOES IT TAKE TO GET AN ONLINE MASTER'S IN BIOMEDICAL ENGINEERING? The time it takes to complete an online master's degree varies by program and student, and generally depends on the program's credit requirements, a student's previous coursework, and whether a student takes courses on a full- or part-time basis. Biomedical engineering online master's programs have different requirements, and degrees range from 27-36 credits. In some cases, students need additional time to complete their thesis, which may not be reflected in their earned credits. If a student has not completed certain science and math courses prior to entering a biomedical engineering program, they may also be required to complete additional credits beyond those required for the master's degree. The choice to pursue coursework as a full- or part-time student will greatly impact how quickly one can complete their degree. Some programs are self-paced, where students complete courses at their own pace. Others require students to proceed through the program in a cohort; everyone who enters the program at the same time will take the same classes each term and graduate as a unit. Full-time students can usually complete a program in one year, while part-time students may take several years; some biomedical engineering programs are even designed to be completed in two years or less. There are two main types of institutional accreditation, regional and national. Regional accreditation requirements are fairly standard due to the small number of regional-accrediting agencies, and regional accreditation is generally considered more prestigious. National accreditation generally applies to career and trade-based institutions; due to the diversity of institutions, national accreditation requirements vary greatly. It is easier to transfer credits from a regionally accredited college, and graduate or doctoral admissions may require applicants to hold degrees from regionally-accredited colleges. Credits from an unaccredited college will likely not transfer. Along with certifying the quality of education, accreditation is also an important factor in financial aid. The Department of Education (ED) and the Council for Higher Education Accreditation (CHEA) recognize both regional and national-accrediting bodies. If a student attends a college that is not regionally or nationally accredited by an agency recognized by the ED, they will not be eligible for federal grants or financial aid. The ED and CHEA oversee all of the accrediting agencies, and prospective students should determine if an institution is accredited on the ED's website before applying. There is also program-specific accreditation, which applies to particular degrees and subjects within schools. Biomedical engineering programs may be accredited by the Engineering Accreditation Commission of ABET, which ensures that a program meets rigorous standards established by the profession. Prospective students can search for an accredited program on their website. Online biomedical engineering master's graduates are prepared for careers in engineering science and physiology, which directly apply to positions within pharmaceuticals, medical technology, and multiple aspects of engineering. With these credentials, degree holders can pursue many fast-growing careers. According to the Bureau of Labor Statistics, biomedical engineering and medical laboratory technologist jobs are growing at a faster-than-average rate. Other career paths include biostatistician, tissue engineering, and nanotechnology. These professionals combine engineering and science to design and create healthcare equipment. The largest employer of biomedical engineers is medical equipment and supplies manufacturing, and engineers also work in hospitals and pharmaceutical manufacturing. They generally work in teams with scientists, other engineers, and healthcare workers. Technologists perform tests that analyze body fluids and cells. The median annual wage for technologists in May 2016 was $61,070, and the employment of technologists is expected to grow at a faster than average rate within the next decade. Over half of all technologists are employed by hospitals. Primarily working in teams, technicians help scientists conduct tests and experiments. Over a quarter of biological technicians work in research and development, and others are employed by colleges and universities, the government, and chemical manufacturing. Most technicians work in a lab, but some also perform fieldwork. Biochemists and biophysicists study processes such as cell development, growth, and disease, and often collaborate with bioinformaticians to analyze their data. Online master's degree biomedical engineering graduates qualify for some entry-level positions in this field, but to work in independent research and development, a PhD may be required. These managers plan and coordinate activities in an engineering firm. While most work in offices, some also work in laboratories. This position is usually reserved for engineers with more than five years of experience. Over half of all engineering managers work in manufacturing and engineering services. Almost all jobs within biomedical engineering require at least a bachelor's degree in the field. According to Payscale, however, a master's is preferred. Several careers, including biostatistician, may require a graduate degree. Students with bachelor's degrees in other engineering-related areas can also pursue a biomedical engineering graduate degree to move into this rapidly-growing field. Most jobs have median entry-level salaries well above the median annual wages for all occupations, which the Bureau of Labor Statistics lists as $37,040. Additionally, those who remain in this field experience higher earning potential as they move through their career, and they may also advance to management roles. Students interested in pursuing a biomedical engineering online master's degree should complete the Free Application for Federal Student Aid (FAFSA). The FAFSA is required for students to determine their eligibility for federal financial aid and work study. In addition to financial aid and loans, other financial support may be offered via scholarships and grants to incoming students. Some colleges of engineering also offer their own scholarships. Students should research any other outside financing that may be available for those pursuing biomedical engineering or graduate engineering degrees.